Chalk mugs - the interactive giveaways with exposure-boosting potential! In order to keep your business afloat, you have to strategically pick your promotional campaigns. They cannot be too expensive, as you might lose money. Furthermore, they cannot be plain or boring - they have to grab the attention of every potential customer and KEEP it! So, in essence, what you need is something with potential and a low price; perhaps even a promotional product that will boost your brand exposure in just a few weeks. But what kind of promotional product? What in the world can generate such incredible results, and fast? 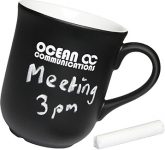 Well... have you ever considered branded chalk mugs? Let's face it - your marketing merchandise ought to be exceptional if you want them to generate any results. Because of that, the usual stuff just won't do. You have to go the extra mile and think out of the box. That's why you really should consider using promotional chalk mugs to your advantage. These mugs are like printed post-it notes and mugs, all in one package! Thus, they can double your chances when it comes to boosting brand awareness, not to mention boosting revenue and getting new clients. One thing is for certain - promotional mugs are always desirable. 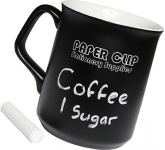 However, in terms of printed chalk mugs, you are at an even bigger advantage when compared to your competition. These mugs will have your logo on them, but they'll also come with a blackboard coating. That way, you can use them to write out personalised messages for all your clients, making them feel extra special. Lastly, the practicality of using these mugs is incredible. All your employees can use them to jot down messages and ideas all day long. And, when another idea comes up, they can easily erase the previous one and use the mug again! Thus, with each motion and with each change of the message, your logo will, once more, be visible for everyone to see. Top that off with their low price and durability, and you've got yourself products that will inspire results for years to come! If you're about to visit a trade show, an exhibition or any other promotional event, don't forget to order these fantastic mugs for all your current and potential clients. Trust us - your stand will become the go-to place for the best promotional products, and with that, your popularity will surge! 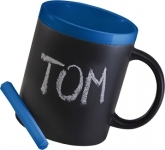 What makes promotional chalk mugs so compelling is the way they can capture anyoneÃ¢â‚¬â„¢s attention. All it takes is for one person to pour some tea, take a sip, and in an instant, that will generate at least a couple of impressions. Now imagine what would happen if you were to give these mugs to all your employees. 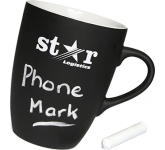 These branded chalk mugs will be the talking point among your clients as well. They will be intrigued by them, not to mention willing to take them home and use them every day! 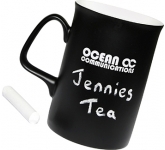 We offer a variety of printing options on our range of promotional chalk mugs utilising the very latest in print technology to ensure that your corporate gifts portray your company in a professional and truly eye-catching, memorable manner. 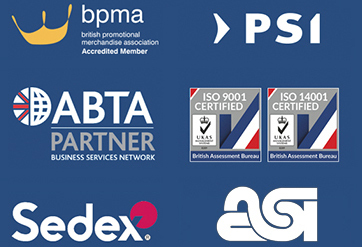 So, if you are looking for low cost, budget, value or cheap printed chalk mugs, and happen to find the same mugs cheaper, with the same print specification and turnaround, just let us know and we will match the price and back it with our industry Award Winning Customer Service - that's our guarantee! 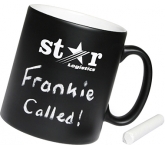 For additional information on our range of promotional chalk mugs or how promotional mugs can help your business, why not contact us and have a chat to one of our dedicated account managers who will be happy to advise you further.